When reading to a baby, especially a squirmy one, it’s not necessary to get all the way through the book in chronological order. At this stage, it’s just as beneficial to turn the pages together and look at the pictures while pointing out some of the details. Your baby will be stimulated by the sound of your voice and start to develop listening skills. Eventually, you can progress to pointing out words, or sweeping your finger along as you read. This helps children understand that the words are in the book, not made up by the reader. Other early skills include learning where the front and back of the book are and where to start reading. When you’re out and about, point out the words around you—stop signs, food labels, store logos. Finally, don’t limit your own reading to after the kids are in bed. 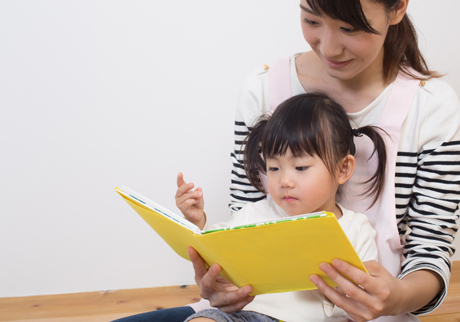 Children are natural imitators, so if they see you reading, they’ll want to pick up their own books and do the same.